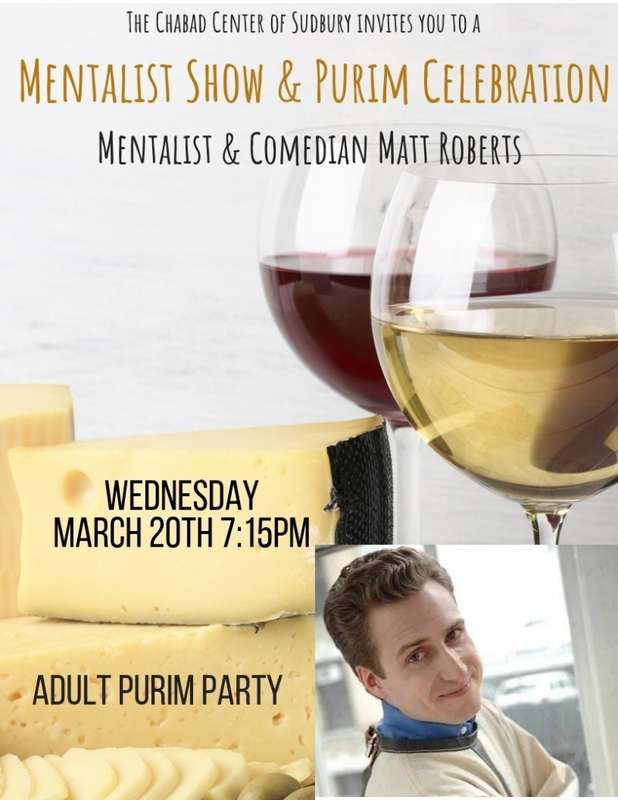 The Chabad Center of Sudbury invites you to join us for an Adult Purim Celebration that will feature a stunning performance by Mentalist & Comedian Matt Roberts. Enjoy a rich array of Israeli and other fine wines, assorted cheeses and horderves as you enjoy an evening of fun, socializing and more as we celebrate Purim in style. The program is called for 7:15pm and will include the Mentalist Show, a Purim Megilla Reading, Wines & Cheeses and more, and a memorable and enjoyable evening. Suggested Donation: $15 for Paid RSVP's before March 10th / After that or at the door is $20 per adult or what you are able to do. Feel free to share and invite your friends to this event. On Thursday March 21st we will be hosting a Family Purim Celebration at 5:30pm - 7:30pm you can see more info over here.